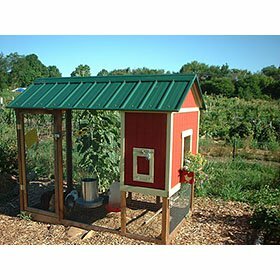 Add a secure chicken run to your coop! 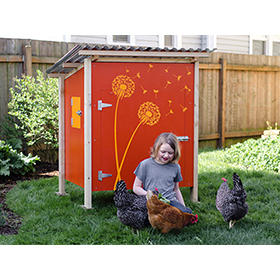 The Garden Run modular enclosure series lets you create and extend a beautiful, safe outdoor habitat for your backyard flock. Build a single design, or combine them for as much space as you need. This chicken run is not meant to be your chickens' primary shelter. You will still need to attach a coop or hen house. These detailed plans come as a downloadable 80-page, full-color PDF ebook, written for beginners. Tools and materials, measurements, cuts, techniques, connections, how to build a pop door, sample configurations -- everything's spelled out with step-by-step instructions and dozens of illustrations, pictures, and tips. Both U.S. (feet/inches) and metric (mm) measurements are included. And as with all of our plans, you get email support from the designer should you need it. There are three core designs included in the plans, plus some extras. Build as-designed or use the plans to jump-start your own creativity! Quarter-Height Design - A great place to start! Connects to just about any coop and opens at the top for cleaning. Measures about 5'w x 3'd x 2'h with a footprint of 15 square feet. Half-Height Design (with garden top) - Features a wide front door and a specially designed permeable rooftop garden bed (not a roof) -- ideal for growing succulents, flowers, or herbs. Measures about 5'w x 3'd x 4-1/2'h with a footprint of 15 square feet. Walk-In Design (with pergola) - Features a people-sized door for easy entry. Grow vines up the side and over the pergola for beauty, aroma, and shade. Measures about 6'w x 6'd x 7-1/2'h with a footprint of 36 square feet. Roof (optional) - Designed for the quarter height and half height units (not the walk-in), it gives extra shelter from the rain, snow and sun. 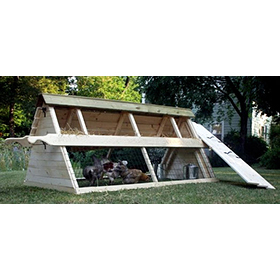 Each unit is built atop a secure foundation to protect your hens from digging pests and predators. Keep in mind, the Garden Run is not intended to be your chickens' primary shelter. You will still need to attach a coop or hen house. All materials are standard and easy to find. Budget about $100 for the quarter-height design, $200 for the half-height design ($140 if you leave off the garden top), $50-70 for the optional roof, and $260 for the walk-in. Tools Needed: Circular saw or miter saw, power drill/driver and a few drill bits, tape measure, level (helpful for larger configurations), pencil, pair of sawhorses, handsaw (helpful for quick cuts), hammer, combination or speed square, a couple clamps with a 3" capacity, wire/metal snips for 19-gauge wire or heavier, sandpaper or a power sander, paintbrush, drop cloth, pneumatic stapler with compressor (optional, but helpful for larger configurations), ladder (Walk-In module only). For Half-Height garden-top module you also need a heavy-duty staple gun (optional, for securing landscape fabric to garden top), scissors for cutting landscape fabric, and a shovel and wheelbarrow for filling garden top with planting medium.